Lasagne is classic comfort food. There's no reason why it can't be tasty and healthy. This healthier version has been simplified to save you time and money - espeically great if you're trying to eat healthily on a budget. I’ve seen healthy lasagnes that cut out the pasta. To me, this isn’t actually a lasagne anymore. It’s just baked vegetables with some cheese. The short answer is no. Pasta isn’t to be feared. Pasta is not fattening. But if you're alwasy eating pasta and not getting in enough variety or veg, then that's not awesome for your health. Balance is key. In fact, research keeps coming out saying that pasta eaters tend to weigh less and that pasta doesn’t make you gain weight. To be honest, I eat pasta because I don’t want to go through life NOT eating pasta. I spent too many years avoiding the stuff and it didn’t make me lose weight or feel very happy. Rather than cutting out pasta, aim to add in way more veg - which is what I've done with this recipe. I like to think of pasta as a wonderful vessel to help me get more tasty vegetables. Plus, if it means the kids will actually eat it, then it's a massive win. You'll also realise as you make this recipe that there actually isn't that much pasta... Just enough. It's wonderfully balanced. Can I eat cheese? Is cheese fattening? To make this healthier lasagne, I've cut back on the cheese because like pasta, balance is key. But you can't have lasange without cheese. Nor do you have to cut out cheese to be healthy. Ricotta is the base cheese in this lasagne and it's loaded with calcium for stronger bones and it's got a good amount of protein (without being too heavy). I've subbed in parmesan, which adds a lot of flavour. I'm trying to eat a little less meat so I've subbed out the meat (hello meat-free Monday! ), adding in loads of veg. You could add some cooked mince if you’re keen. But I bet even the meat lover in your family will get a kick out of this recipe. This dish is loaded with lycopene, the stuff that makes tomatoes red, and it's so good for your heart and skin. You’ll also get the goodness of mushrooms and spinach (hello, iron!). In fact, the vitamin C in the tomatoes and spinach will help you absorb more of the iron. 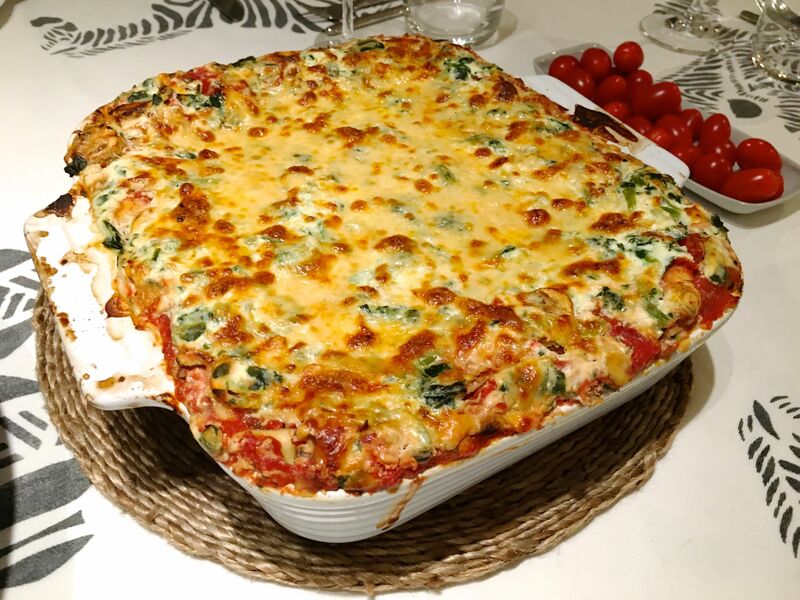 So, I hope you enjoy this delicious and healthy lasagna recipe! Leave me a comment below or rate it 5 stars if you like it. Before adding the tins of tomato, drain off the excess liquid a little. You don't need to get rid of it all but just draining a little will help. Use gluten-free pasta is you're allergic or intolerant. Got fussy eaters who don't like mushrooms? Blend them before hand and they won't even know. I often make two of these lasagna's... freeze the other or use it for meal-prep. Fun fact: Americans spell Lasagna with an 'a' and the British spell it with an 'e' as in 'Lasagne'. Both are technically correct! Serve with a side salad like rocket (arugula) with the left over parmesan and some pumpkin seeds (with a balsamic glaze?). Yum. This is a really satisfying healthy lasagna recipe. It’s loaded with vegetables to help you get your 5 serves a day – but it doesn’t compromise on flavour. Best bit? It’s much easier than other lasagna recipes. 400g/14oz frozen or fresh spinach. If frozen, thaw and break up if needed. 1. Preheat the oven to 170c (340f). 2. Combine mushrooms, two tins of tomatoes, garlic and oregano in a small bowl. 3. In another bowl, combine ricotta, spinach, half the mozzarella, salt and milk. If the spinach was frozen into a block, thaw and squeeze to make sure you get rid of the water. If just frozen (like seen in video), no need to thaw or chop4. Oil the casserole dish/pan. Pour the last tin of tomatoes into the base of the dish, spreading it out evenly. 5. Build your layers: Layer 1: Add a layer of the pasta sheets (about 2-3), pressing down gently. Layer 2: Add 1/3 of the tomato/mushroom mix, spread evenly to edge. Layer 3: Add 1/3 of the ricotta/spinach mix, spread evenly to edge. Layer 4: Sprinkle with a little mozzarella. Repeat layers 1-4 until you have finished (approx. three layers, ideally ending with mozzarella).6. Sprinkle evenly with parmesan and place in the oven. Cook for 25 minutes covered with aluminum foil. Remove foil and cook for a further 25 minutes till golden brown. Serve with fresh basil (optional). Loved this recipe? Leave me a comment below and rate it 5 stars!